Supporting the release of his third solo album ‘Planets + Persona’, RICHARD BARBIERI presented an intimate live show that covered many facets of his recording career from JAPAN to PORCUPINE TREE. 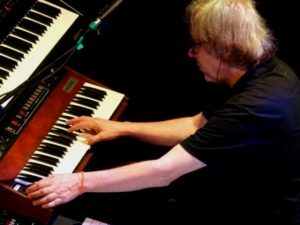 While Barbieri’s rig featured the expected all mod cons like a MacBook, controllers and a Roland V-Synth, the set-up also included his beloved Sequential Prophet 5 and Roland System 700 Lab Series. Accompanied by the versatile Swedish musician Lisen Rylander Löve on saxophone, percussion and voice manipulations, the pair began sedately with ‘Night Of The Hunter – (3) Innocence Lost’ from ‘Planets & Persona’ . Utilising a wide cinematic spectrum of electronic and organic colours, the show started in earnest with the sleazy rhythmic adventure of ‘Solar Sea’. The track’s atonal jazz feel with its spacey momentum saw Löve screeching into a Cold War vintage Russian Army microphone, while drowning her eerie larynx with a variety of gadgets. 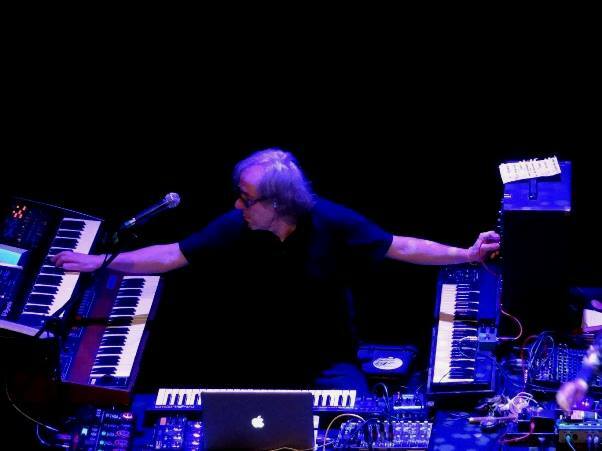 With a warping System 700 bass, it was part avant techno and part ambient as Barbieri moved across his four keyboards to provide texture and atmosphere. 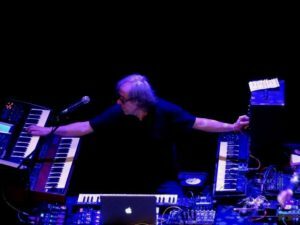 Barbieri handled the familiar detuned percussive blips on his Prophet 5 before playing the haunting string tones on the V-Synth as a drum loop kicked in. “Oh, I didn’t expect that much applause!” responded the Catford boy after the crowd roared with approval at the end. Next, the rumbling sub-bass squelches of ‘Medication Time’ from Barbieri’s debut solo long player ‘Things Buried’ shook the fittings of the venue which was built in 1863. 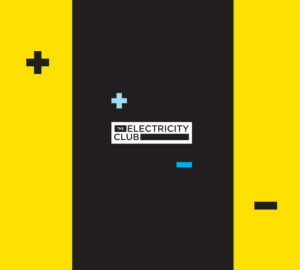 As elements of TANGERINE DREAM filled the room, there was yet another surprise when the melancholic electric piano motif from the JAPAN cover of THE VELVET UNDERGROUND & NICO’s ‘All Tomorrow’s Parties’ appeared at various intervals. Barbieri continued with the work of his former band by playing the gentle “dolphin music” of ‘The Experience Of Swimming’ , the track he composed for the B-side of the ‘Gentlemen Take Polaroids’ single. As the beautifully nautical ambience reached its coda, elements of ‘Nightporter’ were subtly segued in. Löve returned for ‘Unholy’ with the widescreen vibe countered by unsettling Nordic voice samples, before being followed by the spacey avant jazz of ‘New Found Land’ which was originally written by Barbieri for PORCUPINE TREE. During this sequence of music, Löve added a kalimba to her repertoire which enhanced the electro- acoustic balance with an authentic ethnic touch. 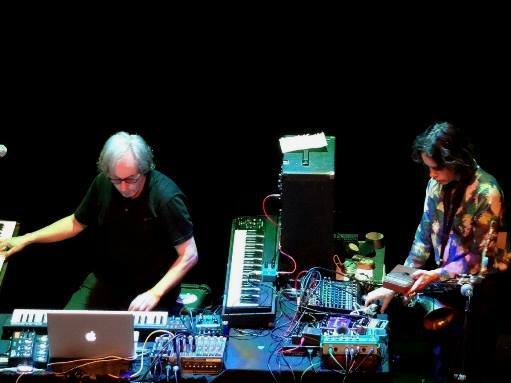 Closing the main part of the show with ‘Hypnotek’ from Barbieri’s second album ‘Stranger Inside’ , the rolling bass sequences, spy drama piano and muted Fourth World tension came together with a musicality that was like a masterclass in instrumental music… MG, please take note! To rapturous cheers, Barbieri returned for an encore and with the self-deprecating humour he had displayed throughout the evening, he joked: “I didn’t want to wait too long, in case it died down”. He treated the appreciative crowd with a superb electronic adaptation of PORCUPINE TREE’s ‘Idiot Prayer’. With the new arrangement at times sounding like SIMPLE MINDS’ ‘Love Song’ or TENEK’s ‘Ice Fields’, it was a fabulously energetic conclusion to proceedings. 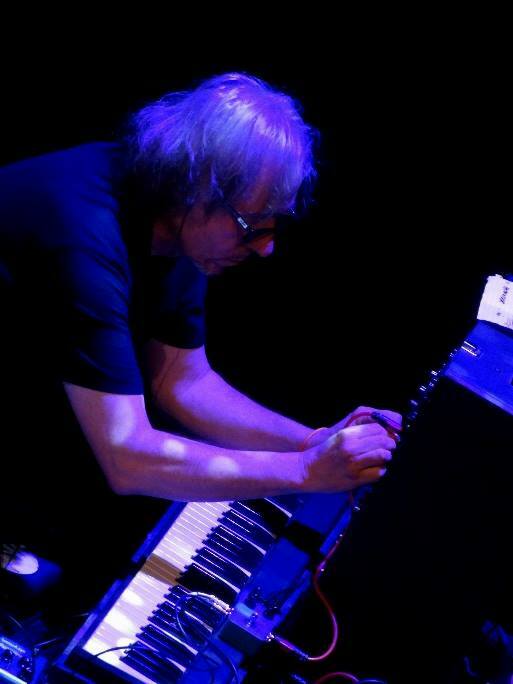 Unafraid to delve into his glorious history, RICHARD BARBIERI ably showed why he is one of the most inventive synthesizer technicians that the UK has ever produced. His modest, down-to-earth demeanour with a willingness to stay in the background has perhaps stopped him from being better known, but the music he produces today is still wonderfully intriguing and deserves further investigation.